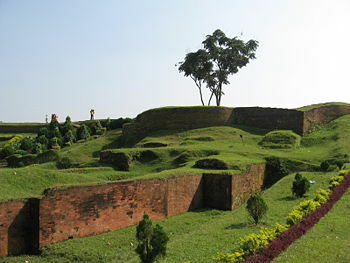 Mahasthangarh is the oldest archaeological site in Bangladesh. It dates back to 700 BCE and was the ancient capital of the Pundra Kingdom. Mahasthangarh is the earliest urban archaeological site so far discovered in Bangladesh. The village Mahasthan in Shibganj thana of Bogra District contains the remains of an ancient city which was called Pundranagara or Paundravardhanapura in the territory of Pundravardhana. A limestone slab bearing six lines in Prakrit in Brahmi Script, discovered in 1931, dates Mahasthangarh to at least the 3rd century BC. The fortified area was in use till the 18th century AD. Mahasthan means a place that has excellent sanctity and garh means fort. Mahasthan was first mentioned in a Sanskrit text of the 13th century entitled Vallalcharita. It is also mentioned in an anonymous text Karatoya mahatmya, circumstantially placed in 12th-13th century. The same text also mentions two more names to mean the same place – Pundrakshetra, land of the Pundras, and Pundranagara, city of the Pundras. In 1685, an administrative decree mentioned the place as Mastangarh, a mixture of Sanskrit and Persian meaning fortified place of an auspicious personage. Subsequent discoveries have confirmed that the earlier name was Pundranagara or Paundravardhanapura, and that the present name of Mahasthangarh is of later origin. Mahasthangarh, the ancient capital of Pundravardana is located 11 km (7 mi) north of Bogra on the Bogra‐Rangpur highway, with a feeder road (running along the eastern side of the ramparts of the citadel for 1.5 km) leading to Jahajghata and site museum. It is believed that the location for the city in the area was decided upon because it is one of the highest areas in Bangladesh. The land in the region is almost 36 m above sea level, whereas Dhaka, the capital of Bangladesh, is around 6 m above sea level. Another reason for choosing this place was the position and size of the Karatoya, which seemed to be as wide as the sea. Mahasthangarh stands on the red soil of the Barind Tract which is slightly elevated within the largely alluvium area. The elevation of 15 to 25 metres above the surrounding areas makes it a relatively flood free physiographic unit. The fortified heart of the ancient city, is rectangular in plan, measuring roughly 1.523 km long from north to south, and 1.371 km from east to west, with high and wide ramparts in all its wings. The Karatoya , once a mighty river but now a small stream, flows on its east. Till the 1920s, when excavations started, the inside of the citadel was higher than the surrounding areas by over 4 metres and was dotted with several straggling elevated pieces of land. The rampart looked like a jungle clad mud rampart with forced openings at several points. The rampart was 11–13 metres higher than the surrounding area.